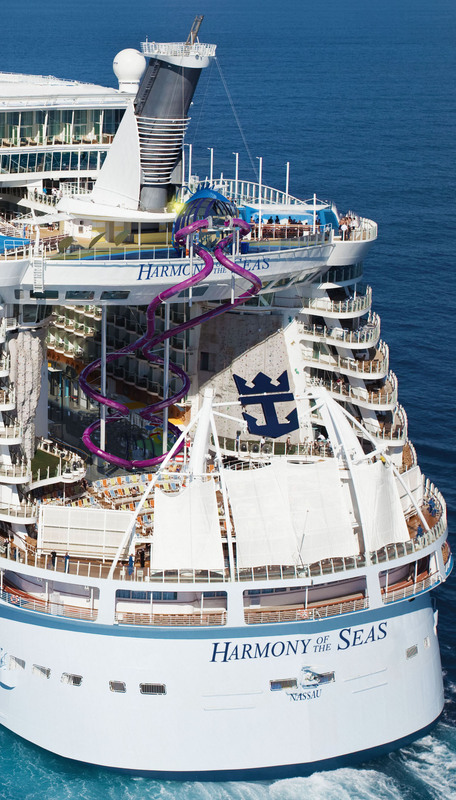 Royal Caribbean International has finally revealed the design of Harmony of the Seas‘ The Ultimate Abyss, the tallest slide on a cruise ship, which will span 10 decks. The dry slides will tower at 46 metres (150 feet) above sea level and will overlook the AquaTheater at the aft of the ship. The pair of side-by-side custom-built slides will see adrenalin-seeking travellers hurtle along a chilling 30 metre (100 foot) drop that includes serpentine-like twists and turns. Riders will travel approximately nine miles per hour from the Pool and Sports Zone on Deck 16 to the Boardwalk on Deck 6 below. Riders will launch from a glass platform offering a glimpse of the Boardwalk 10 decks below. Riders will climb onto a customised mat before taking the plunge. Spontaneous audio effects within each tunnel will create a multi-sensory thrill for daring guests willing to test their mettle while travelling through the 66 metre (216 foot) one-of-a-kind slide duo. The Ultimate Abyss will consist of two separate cylinders, a reflection of one-another, each with a diameter of approximately 80cm (2.6 feet) and constructed of stainless steel. Harmony of the Seas will become the world’s largest cruise ship when it launches in May next year. The 227,000 gross ton ship will feature 2,747 staterooms and will have a capacity of 5,497 guests based on double occupancy. The ship will blend the exclusive seven neighbourhoods found on Oasis-class sister ships Oasis of the Seas and Allure of the Seas – Central Park, Boardwalk, the Royal Promenade, the Pool and Sports Zone, Vitality at Sea Spa and Fitness Centre, Entertainment Place and Youth Zone – with innovative features found on the Quantum-class ships Quantum of the Seas, Anthem of the Seas and the soon-to-launch Ovation of the Seas. Royal Caribbean’s latest Oasis-class ship will sail two short three- and four-night cruises from Southampton in May 2016 before repositioning to Barcelona to sail an inaugural Mediterranean season. In late October 2016 the ship will reposition to Fort Lauderdale, Florida, where it will operate on alternating seven-night Eastern and Western Caribbean itineraries.